Good evening, dear readers! I hope this post finds you well! I'm in a time crunch to get this post up before launch time which is quickly approaching so I'm going to keep the chit chat to a minimum and jump into the real reason you're here anyway. Ready? Let's do this! 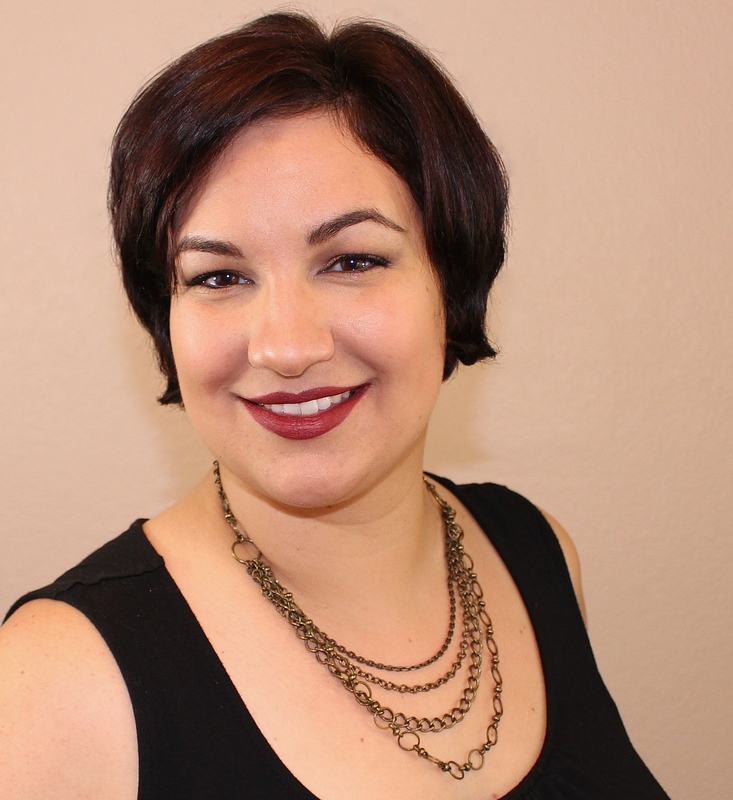 I had the pleasure of meeting the lovely Joy of Joy Lacquer in Las Vegas this summer, and she kindly gave me a few bottles of her about-to-launch KinderQueen Collection. Joy's daughter is starting up kindergarten this year, and as any parent knows, that is a huge milestone! My oldest isn't quite there yet and only attends pre-school a couple hours a week, and I can only imagine how it feels to have your baby make the next leap! Joy created the KinderQueen Collection to celebrate this major milestone in her daughter's life, and I hope you enjoy it as much as I do. Let's check out some polish! A rich iris purple linear holo with a subtle red/orange chameleon shifty-ness and a smooth finish. In honor of her starting Kindergarten this year, Josie's favorite color purple, is named after her in this school themed collection. I had to start out this post with Josie's namesake! The base shade is majestic, but it is the subtle shift that really makes this polish divine. You definitely feel like royalty with this beauty on your nails! The application was incredibly smooth, and the formula not too thin or thick for my liking. A linear holographic pink that's fun and bright, I Heart My Teacher is even more beautiful when you notice the combination of subtle gold and lavender flashes that catch in the light. Being a teacher takes patience, commitment and a huge heart and this is my tribute to the incredible people that make up the fiber of the education system. Teachers, we heart you! We've all had one of those teachers that you always think of fondly. I've had several wonderful teachers over the years, but it is my 6th grade science and math teacher that always comes to mind when I have to think of my favorite teacher. She was always in a cheery mood and full of energy, and I Heart My Teacher is the most perfect shade when it comes to her! Obviously this isn't about me, but it does make me warm and happy inside. As for the formula, it is perfection on a brush! A bright blue-green color that leans deeper emerald and has a light holo finish. This bright teal is more than meets the eye because you'll notice it pops with electric blue sparkles and shimmers with a bright green and gold flash. As a kid, the much anticipated Show and Tell Day was the highlight of our week and this polish is definitely brag-worthy. I remember having Show and Tell days at school, but I honestly cannot recall a single thing shared, either by myself or one of my classmates. I'm really looking forward to my boys getting to take part in their own and seeing what they deem worthy to share with their classmates! As for the polish, it is exquisite and the name is brilliant! I am hesitant to say this one is my favorite as the others are so pretty, but the pops of blue and the gold flash certainly makes this a contender for top spot. Like the others in tonight's post, this applied really nicely for me and I have no issues to report. A beautiful royal-blue violet with a sparkling jewel-like shimmer. There is abundant purple and blue micro-flecks throughout the polish and dash of scattered holo dust that gives it an extra twinkle. The one thing you remember most about your first crush is the color of his eyes and this polish was made to match a dreamy shade of blue. I've thought a lot about my past school crushes, and I can only really remember one that had blue eyes. I always tended to be more of a fan of brown eyes. That being said, I probably would be crushing on a boy with eyes this blue! The base colour is lovely, and the pops of purple add the most amazing dimension to this beauty. This applied really easily for me as well. These four shades and the rest of the KinderQueen Collection will be available for purchase on the Joy Lacquer website located here September 9th at midnight EST/9PM PST. Each bottle will retail for $10.50. If you wish to purchase the full collection, use discount code KinderQueen at checkout and save $1 off each bottle. 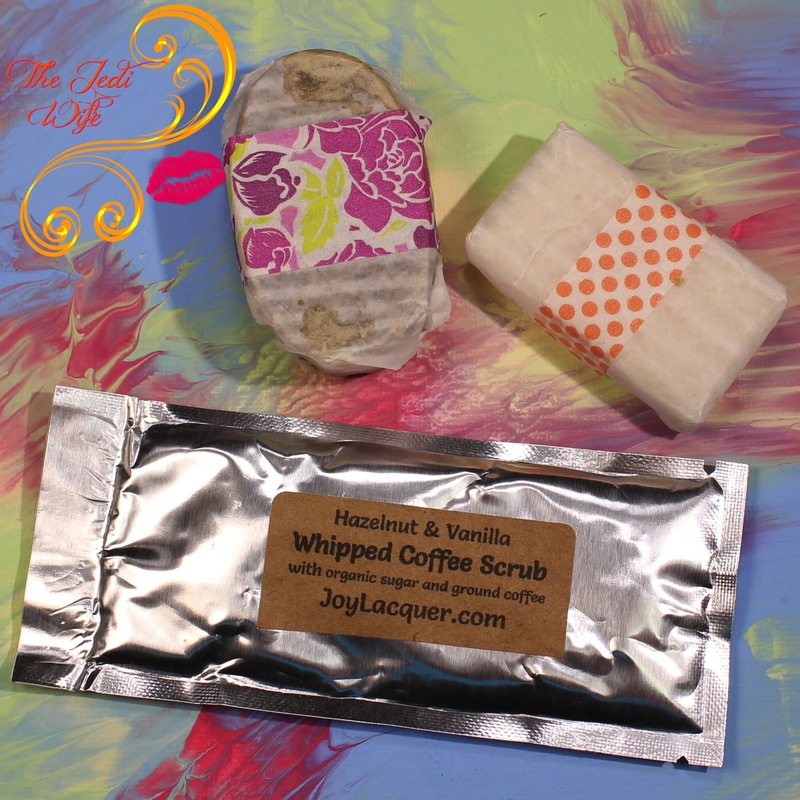 I also got a few other goodies from Joy Lacquer that are already on the shop for purchase. While I don't drink regular coffee (my coffee drinks are generally sugar, more sugar, and a dash of coffee), I really love the smell of coffee! 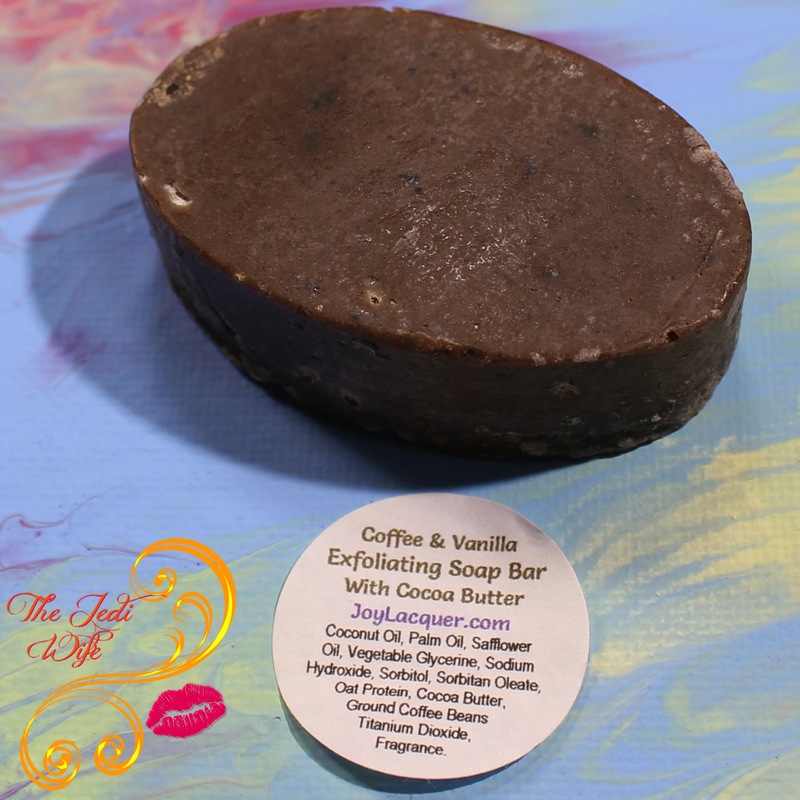 This Coffee & Vanilla Exfoliating Soap Bar is delicious! No, I did not eat it, but I am the weirdo that keeps smelling the bar every chance I get. This Awapuhi & Oatmeal Exfoliating Soap Bar is the more mild in terms of gentler exfoliation. 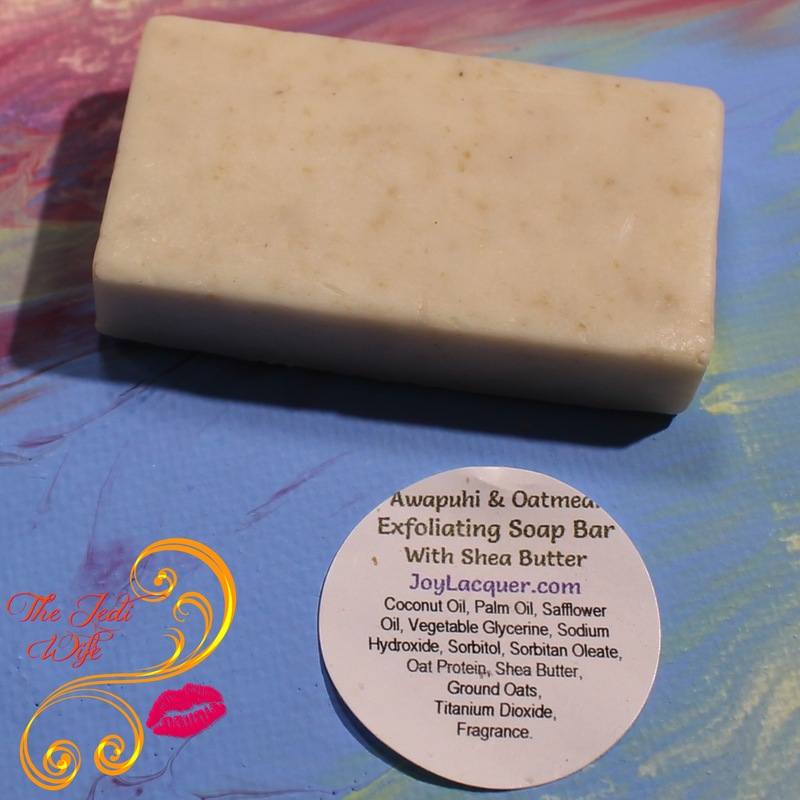 My skin is really sensitive, and I found myself grabbing for this bar the most to remove those pesky dead skin cells, leaving behind soft, glowing skin. I love to cook, and I am always cutting up onions and garlic for one reason or another. The downside is it leaves my hands smelling like bolognese-in-progress. While I don't mind it, I know it can be offensive to others. 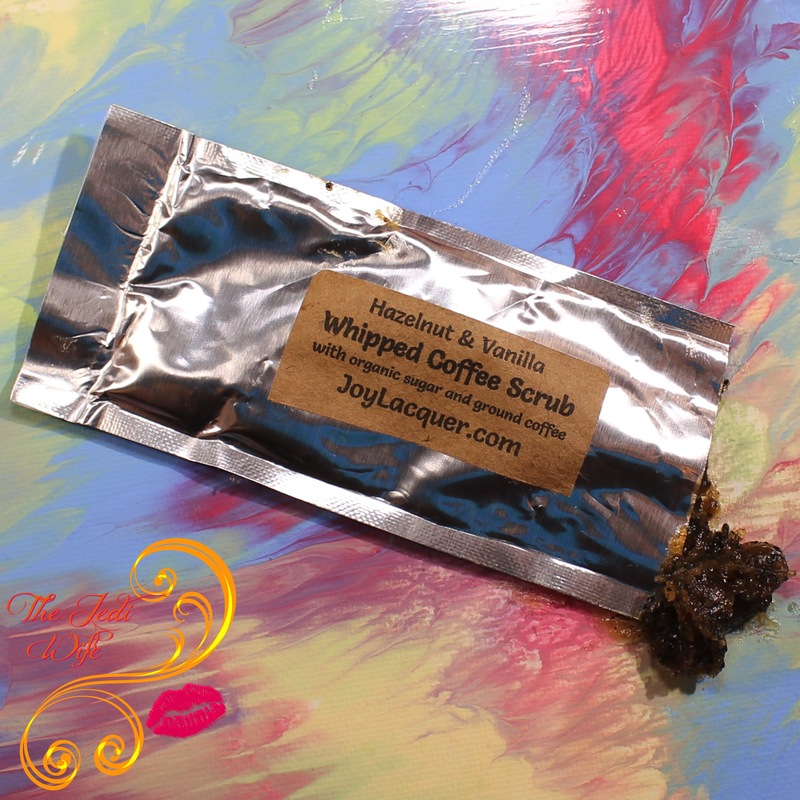 This scrub is fantastic because coffee is a fantastic odor neutralizer, and it does a great job at removing dirt(my toddler can vouch for that!) and those pesky shimmers that like to hang around post-polish removal. These are my first products from Joy Lacquer, and I am kicking myself for waiting this long to try out the brand! I'm really impressed with the quality of the products, and I definitely see more coming into my life when the budget allows! What do you think of the KinderQueen Collection? What colours are your favorite? What older Joy Lacquer shades do I need to pick up and/or track down? I'd love to hear from you! Very pretty collection! I like Crush on the Blue Eyed boy the most. Loving this collection and the swatches. I have to try her bath and body products! These swatches are so flawless, I've recently become addicted to Joy Lacquer after trying her out for the first time in a box. I love the idea of a First Day of School collection, it was always my favorite time of the year as a child. Great swatches! I really need to try Joy Lacquer! Joy is one of my favourite brands ever! Show And Teal Day is my favorite! Gorgeous collection and pretty swatches. I love it! The soaps look amazing too!